This entry was posted in Writers Corner by Julia Glattfelt. Bookmark the permalink. LOVE THIS POST! It encapsulates so many of the reasons that Yeshua IS NOT THE REASON FOR THE SEASON!! 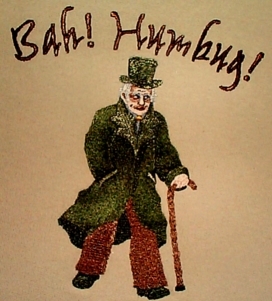 I was saying “Bah Humbug” this past season more than ever but clearly didn’t know the meaning – I was just so tired of being wished “Merry Christmas” – so excited to know what it means now! I’ll say it more often – lol – I’m sure it will be a conversation starter! Kinda like the conversation I had with a customer service manger and explained that I HATE CHRISTMAS and that I hate it because it’s ACTUALLY PAGAN and sooo many Believers are deceived and that he’s encouraging his staff to propegate the great PAGAN deception to people when he forces them to say Merry Christmas to customers! I have a feeling he will REMEMBER that conversation! Thanks for this post of raw TRUTH! SHALOM! I stopped celebrating christmas a few years ago. I chose to celebrate the birth of our Lord every day of the year and I am learning about the holy days that Elohim told us to observe in the Torah.. I googled christmas and it’s origin and that was enough for me. Thanks, Julia! The TRUTH will definitely set one free, but it usually hurts a bit at first! But not for long! So let us rejoice and worship the King in spirit and TRUTH!